The fast-growing crossover segment is becoming crowded with Peugeot’s announcement that it’s new 2008 will hit our shores this summer. Building on the experience and popularity of its 3008 Crossover model, Peugeot says this car will satisfy customers around the world with a design that is ‘modern, stylish, practical and very capable’. It’s based on the 208 and is designed to compete with the upcoming Vauxhall Mokka and Ford’s EcoSport though it really takes on the Nissan Juke. Indeed, the 2008 borrows heavily from the 208, including the front grille and headlights. The driving position is higher and there’s a bodykit to help the car stand out from the crowd. Peugeot say their new crossover is the first vehicle produced by them that has been designed and developed for several international markets simultaneaoly – by doing so they are hoping to attract new customers to the marque. The firm says a new breed of customer is emerging for cars such as the 2008, and Peugeot says it should do well in Europe, Asia and Latin America. The Peugeot 2008 also borrows the engines from the 208 range and will have a ‘Grip Control’ traction system, similar to that used on the 3008. Peugeot is taking orders from June with deliveries set for a couple of months after that and they are hopeful they can replicate the success of the 208 which racked up 20,000 orders in the UK in its first six months on sale. There’s no indictaion of prices yet but you can expect they will be competively priced in the region of £13,000. 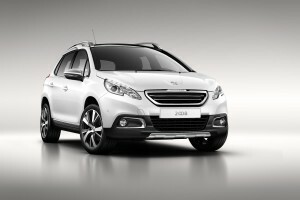 The new Peugeot 2008 will make its world debut at the Geneva Motor Show in March. This entry was posted in 4X4 Car, Car Updates & Releases, Family Car, New Cars and tagged 2008, Asia, car, EcoSport, Europe, ford, Ford EcoSport, Geneva Motor Show, GM, Grip Control, LS, Mokka, MoT, new peugeot 2008, nissan, nissan juke, peugeot, Peugeot 2008, price, Sport, UK, vauxhall, vauxhall mokka by Steve Lumley. Bookmark the permalink.